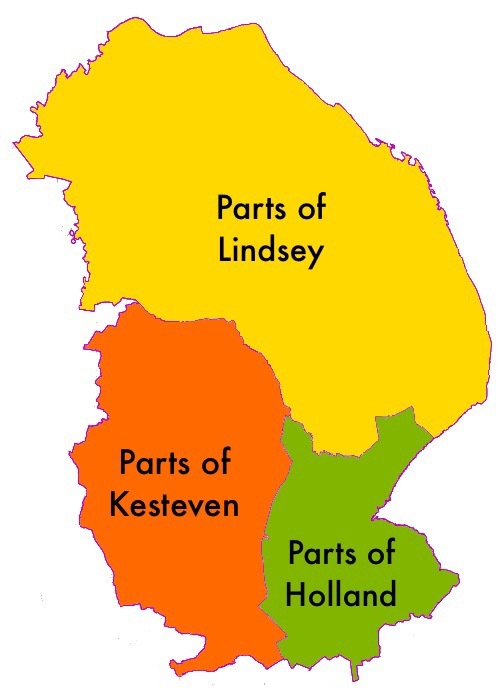 The county of Lincolnshire subsumes three unique divisions termed “Parts”; namely, Lindsey, Kesteven and Holland. Lindsey is in the north of the county, Kesteven in the south-west and Holland, the south-east. The Parts were administered separately and each one received its own council in 1889. Following the 1972 Local Government Act, the Parts were no longer used as a basis for local government but they have never been abolished and retain their cultural and geographical significance. In 2012 revised government regulations on the flying of flags, specifically cited potential flags for the Parts of Lincolnshire, as being free to fly without any local authority consent, seemingly inviting their creation! The following three designs are presented accordingly. The background, or field, of the fly end of each flag is a different colour and each bears a distinct, locally resonant emblem. Together, these three colour fields and the common red hoist division, recall the red, gold, blue and green colours of the county flag. The proposed flag of Lindsey features a blue field to represent the important sea-faring trades and geographic location of this coastal territory. A golden vessel, with an unfurled white sail, continues the theme. A similar arrangement was used by the former Lindsey Council for its civic arms. Against a green field recalling the verdant countryside of the locality, an ermine band on the proposed Kesteven flag, represents the Roman “Ermine Street” which traverses the territory across its whole length. of the former Holland Council are also present on the proposed flag; these are similarly set against a golden field, the Parts of Holland being famed for its bulb cultivation. This entry was posted in Lincolnshire. Bookmark the permalink.